James Robinson has a birthday today. 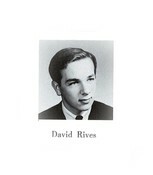 David Rives posted a message on James Robinson's Profile. James, Haven't gotten around to updating my Profile, but, was checking where all our classmates are living and noticed that it said only one person was living in Missouri. Well, that's not exactly true, since I happen to be writing this from my house in Liberty! So, where exactly are you in "Kansas City"? James Robinson posted a message.